You don't need to spend excessive amounts to get an expertly tailored window treatment. 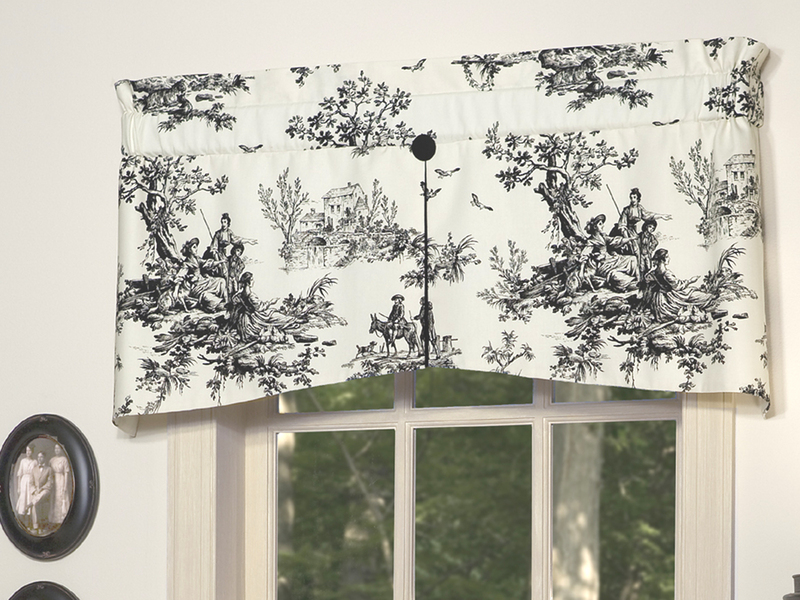 With this beautiful Thomasville Bouvier black and white toile valance, your home will look like a professional interior designer has hard been at work. This window topper features an attractive inverted pleat in solid black at the center. It is adorned with a black cloth-covered button at the top of pleat. The curtain has a slight border above the rod and is designed to turn in at the sides. The Bouvier center pleat valance is also fully lined. It features a 3-inch rod pocket to easy installation with a 2½-inch continental rod. Measuring 50 inches wide by 20 inches long, the Bouvier by Thomasville valance works best with a window measuring up to approximately 43 inches wide. For smaller windows, the excess can be gathered on the sides and/or evenly distributed throughout the width of the curtain rod. This valance is made in the USA. A low keyed modern pattern on an off white ground, celebrating sage green and light blue and royal blue on a soft white ground. Pleats are in Imperial Cerulean Blue. Three inch rod pocket, and no header. Use a 2-1/2" continental rod for hanging. Need a different width? Call or email us for a quote. 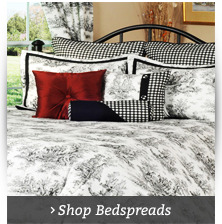 The Aristocrat Devon stripe valance in black is made in the U.S. The three-piece set includes two jabots measuring 12 ½-inches by 22 inches (each banded with a coordinate fabric) and one center measuring 33 inches wide. 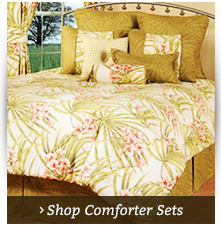 The set fits windows up to 48 inches wide, though additional centers or ascots can be used for wider windows. Use a standard double curtain rod to hang. Measuring 54 inches wide by 16 ½ inches long, the fully lined Tippi Bluebird London valance features a leafy vine print in periwinkle and white tones along with bluebird silhouettes. The 3-inch rod pocket fits a 2 ½-inch continental rod with a width of 41 to 49 inches for easy hanging with no gathering. The valance includes three separate scoops separated by white pleats and bordered by half pleats on each end. 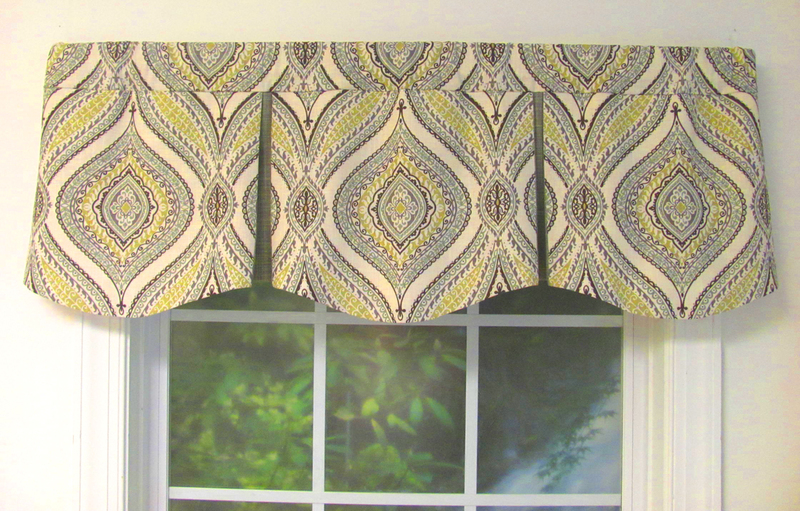 Wider valances in this print may be custom ordered. The London Valances measures 54" wide x 16 1/2" long, has a 3" rod pocket, no header, and is fully line in a high quality off white fabric. Designed to have no gathering, it fits a rod width of 41" to 49". Use a 2 1/2" continental rod for hanging. This valance can be ordered with up to nine scoops and 162" wide. See our Almost Custom section for more information, email or call us toll free. The Katja London valance comes in two color schemes. Blackberry features camel and green tones while Sugar Maple features orange and gold tones. This unique design includes three scoops bordered and separated by pleats in a coordinating color. Measuring 50 inches wide by 18 inches long, the Katja London valance also includes a 3-inch rod pocket. 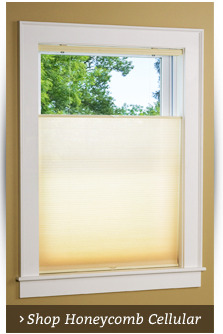 This American-made window treatment is fully lined and should be dry cleaned only. Valance measures 50" wide by 18" long with a three inch rod pocket and no header. Dimensions 79"W" x 19"L on sides. The Camelot Spa Canterbury features aqua and brown on an ivory background. It's made in the U.S. and is fully lined (dry clean recommended). A three-inch rod pocket includes hidden tabs on the back. Thread a 2 ½-inch continental rod for a crisp pleated look or simply shirr it on the rod for a gathered look. The dimensions are 79 by 19 inches. Dimensions: 78"W x 19"L. Made in the USA. The Camelot Saddle Canterbury valance features a paisley print with black, brown and neutral tones. This American-made valance measures 78 inches wide by 19 inches long. It's fully lined and includes a three-inch rod pocket with hidden tabs, perfect for use with a 2 ½-inch continental rod. Shirr for a gathered look or thread the rod for a pleated look). The Double Diamond Canterbury valance features a lovely diamond-shaped pattern with gold, green and rose tones. This fully lined valance also has a three-inch rod pocket with hidden tabs that allow you to thread your rod for crisp pleating. Or, you can simply gather the fabric on the rod for a softer look. This valance measures 78 inches wide by 19 inches long. 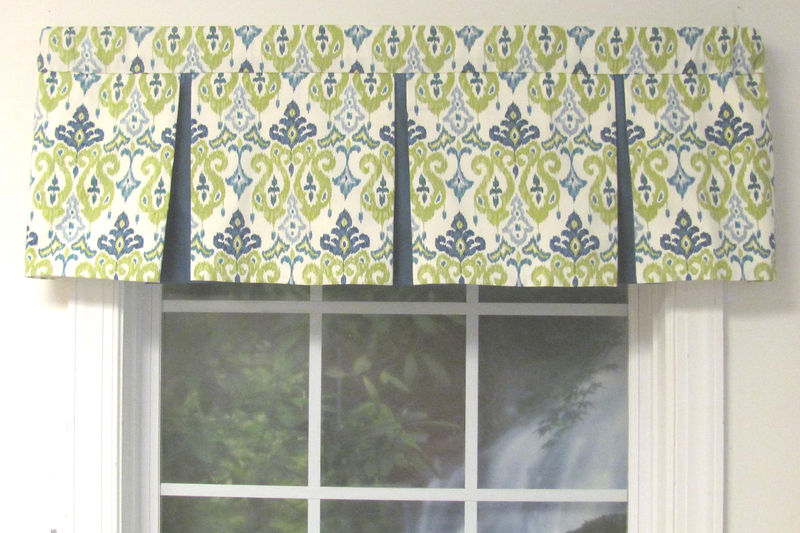 Dress up any window with the Hampton Court Lagoon Milan valance. This fabric features a blue and green large-scale floral print on a mint green background. A coordinating striped fabric accents the center pleat and end pleats. Made in the U.S., this Hampton Court Lagoon valance measures 53 by 17 ½ inches. It has a three-inch rod pocket for use with a 2 ½-inch continental rod and is fully lined with cream material. Dry clean only. 3" rod pocket, no header, fully lined with soft cream lining. Hang on a 2 1/2" continental rod or decorative rod. 3" rod pocket, no header. Use a 2 1/2" continental rod for hanging. The captivating Firenze Carnelian Milan valance features rich copper tones with hints of green in a woven leaf print. An onion skin design in matching copper tones accents each pleated corner and side double pleats. The Firenze valance measures 53 inches wide by 17 inches long. It hangs easily thanks to a three-inch rod pocket made for use with a 2 ½-inch continental rod. These Firenze curtain panels are also fully lined with a soft cream material. Fully lined in soft cream lining. With its stylish paisley print in rich brown tones, the Hampton Court Tea Stain Trumpet valance adds warmth and coziness to any space. This Trumpet valance features two scoops and three trumpets, which give it movement and texture. The bottom edge has rope cording while a three-inch rod pocket makes for easy installation. 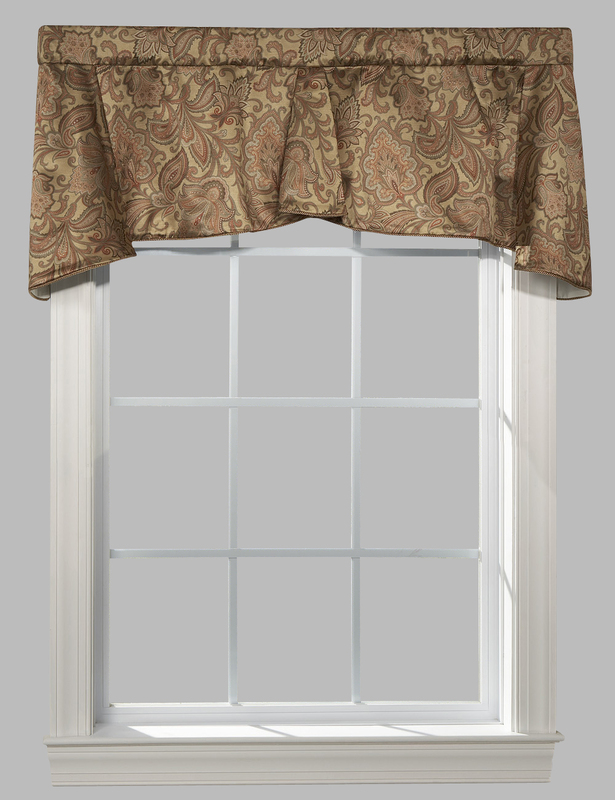 Measuring 48 by 21 inches, the American-made Hampton Court Tea Stain valance fits a standard single window. This gorgeous Pimlico Java Mayfair-style window valance from The Curtain Shop has a large floral pattern in yellows, green, aqua and neutral tones. The background is a deep chocolate jacquard. A double pleat at the center adds fullness. 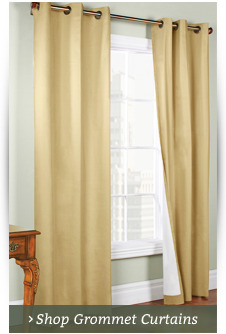 These fully lined window valances with 3-inch curtain rod pockets have rope cording at the bottom of the curved edge. The 50-inch width fits a standard single window. The length is 13 inches at the center and 17 inches at the sides. This exquisitely designed Pimlico Java London valance has a beautiful floral pattern with a sophisticated striped pleat between the scoop shaped border and striped half-pleats on the ends. The fully lined three-scoop valance in a cocoa and aqua floral design has coordinating stripes in aqua and brown tones. It's 54 inches wide and 16 1/2 inches long. You can also custom order this item from The Curtain Shop with up to nine scoops in a 162-inch width. 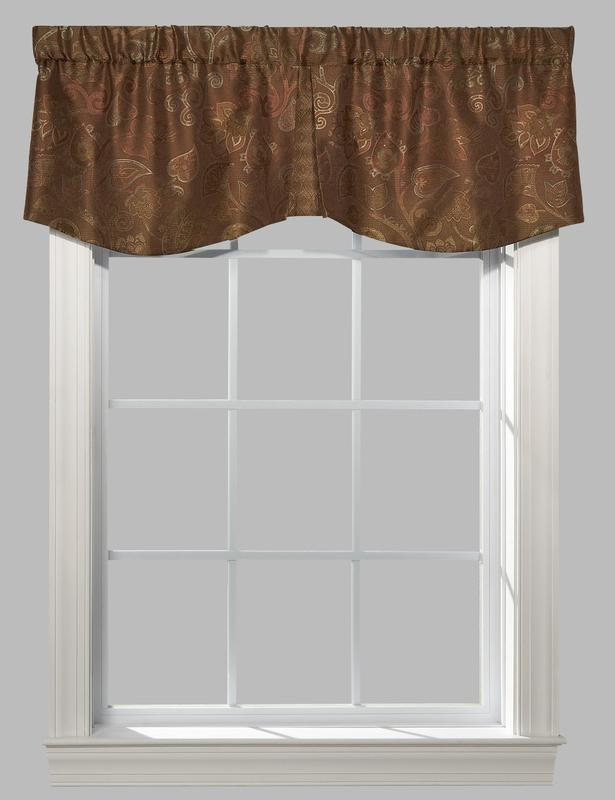 This London window topper with 3-inch curtain rod pocket and no header is designed to lay flat for a sleek look. This Floral Lustre Waterfall valance is undeniably eye-catching. The shimmering, textured woven jacquard features a floral motif and a tassel fringe. The valance measures 48 inches wide by 37 inches long and looks beautiful when layered with multiple valances (as pictured). Hang with a 2 ½-inch continental rod. Choose from four luxurious colors: cocoa, brick, ivory and sage. This imported, unlined Floral Waterfall valance is made from 100 percent polyester. Machine wash warm on gentle, line dry and warm iron as needed. 2 1/2 inch continental rod for hanging. Photograph illustrates three Water Fall Valances, and two panels. All components sold separately. Looking for something a bit traditional to spice up your bathroom, kitchen, living room or office? You'll love pleated valances. These are standard decorative draperies featuring pleating throughout for an extra splash of style and dimension in every single room in your home. The Curtain Shop carries a wide variety of good-looking pleated window valances, including box pleat valances, pleated button valances and London valances to complement your existing home décor and windows. Many of our valances are made in the U.S. and all are expertly tailored for a great look no matter the room. You'll find pleated valances for windows of all shapes and sizes in our shop. The Curtain Shop always offers a price-match guarantee, so if you see the same style for a lower price elsewhere, let us know and we'll be happy to match the price. We specialize in offering the world's best selection of low-priced valances and offer quick shipping on many styles.